CONDAT group ensures its international presence through a network of agents and distributors, and industrial or commercial subsidiaries. We are therefore able to offer our entire product portfolio according to the same quality standards with a global sales policy. Our network is designed to ensure the best logistics conditions and commercial exchanges. 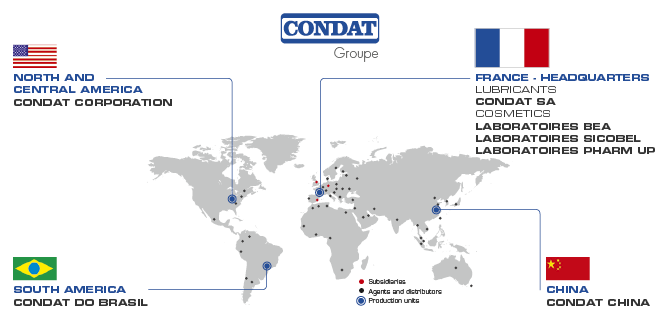 With a dense sales network, CONDAT group has not ceased to develop since the 1980s in all industrialised countries. Achieving 70% of its turnover in export, the group is astute and experienced in good practice in international negotiations. On all fronts, including sales, we undertake to act in a responsible, honest and respectful manner. To find your nearest local representative, discover the section Where to find our products, or to represent our brand become a partner. With the motto Build to Last, CONDAT group has chosen to integrate companies that share common values: high-quality products, scientific and industrial performance, ethical and civic commitment. Backed up by CONDAT group, the Health and Beauty branch benefits from more than 160 years of expertise and has the ambition to become a major actor in this market.